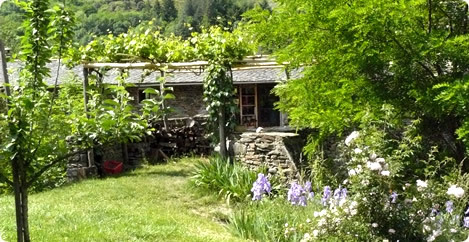 Abri writing courses are held at Gardoussel Retreat, a small, self-contained hamlet 1.5km from the pretty village of St André de Valborgne in the heart of the Cévennes mountains. We are situated about 85 km north-west of the city of Nîmes, in the Gard district which makes up part of the Languedoc-Roussillon region. The hamlet is made up of a former magnanerie (silkworm farm), an adjacent barn, a wooden roundhouse, several ruins and a large stretch of meadow and mountainside. A river flows through the foot of the property. Since purchasing the site in 2005 we have created several extra spaces and now have a total of 9 bedrooms sleeping up to 24 people. We also have 2 living and dining rooms, a roundhouse, a classroom, an outdoor yoga deck and a boma (African-style fire pit). We have also installed a donkey paddock and stable, as well as a chicken coop for our organically-raised chickens. The local area offers a wide variety of hiking trails, river bathing and pretty villages... or you can simply explore the hills behind the hamlet or relax in a hammock in our peaceful gardens & grounds. Our on-site massage therapist, Frances, offers Ayurvedic massages. Alex Duncan, also on-site, is available to give Ayurvedic consultations to anyone interested in knowing more about their Ayurvedic ‘type’ and tips for better health. Note: We are in the heart of the Cevennes mountains in France. Travel requires a degree of planning and forethought. Although we are happy to assist with travel plans, we are not a travel agent. The information below is generally acurate. That said, travel providers sometimes change from season to season. So please take the time to investigate your route well in advance! 3. take a taxi or a lift to Gardoussel (we can often help here). From the train station in Nimes to Gardoussel takes about 2 hours. There are not many buses however, so make sure to study the time tables below under BUSES. To facilitate your time in the great town of Nimes, note that the Hôtel Abalone (23 Avenue Feuchères) just opposite the main entrance to the train station (link to Google Maps) can hold your baggage for 5 euros / day. The easiest way to get to Gardoussel Retreat from the UK is to fly into Nimes from London or Liverpool, with Ryanair, then share a taxi or travel up by bus *. You can also fly into Montpellier (Easyjet and British Airways) or Marseilles (Buzz and BA among others). There are 1-4 buses a day from Nîmes to St Jean du Gard (about 25 mins away from Gardoussel by car) but the handiest is usually the one leaving Nîmes at approx. 17h30 (arr. 18h55). Check for current bus times here http://www.edgard-transport.fr/ or ask us for help. * We can help to organize taxi shares from St Jean du Gard to Gardoussel and are happy to collect you from the village of St André de Valborgne. If our commitments allow, we may be able pick you up from St Jean du Gard, where the bus from Nîmes terminates. All our local airports have hire car depots (see below). Montpellier and Nîmes are each about 1hr 30 mins from Gardoussel, Marseilles is at 2½ hours, Lyon is 5+ hours and Paris about 6-7 hours. Having a car is useful if you want to explore the local area further afield in your free time. If several of you are coming together, it is also a cost-viable alternative to a shared taxi, since the cost of hiring a vehicle can be about the same as the cost of a taxi run. If you are interested in volunteering to hire a vehicle and act as driver, let us know so we can help you organise this. Get detailed road directions to Abri at Gardoussel, St Andre de Valborgne. Rental company Wallgreen werent.wallgreen.com offers very good rates. They have a depot in Nimes and two in Montpellier, also one in Marseilles. You need to get a taxi from the airport to their offices but at prices from 9€ / day they're the cheapest we've found.